Athletes are considered for the weekly top performer poll only if their stats are entered on the MN Volleyball Hub by 10 a.m. on Sundays. Coaches or members of their staffs needing access to enter stats should email mnhubs@sportngin.com. Sami Hilley, Champlin Park. Champlin Park will be a force to be reckoned with this season and among the contenders for a Class 3A state title in part because of Hilley. The junior middle hitter notched 11 kills in 3-0 win over Prior Lake and 14 kills in 3-0 win over Hopkins to kick off the season. Kendal Kemp, Rogers. The freshman middle hitter didn’t waste time establishing herself as a force in the Royals’ lineup. Kemp helped guide Rogers to three wins in the opening week with 38 kills and 11 solo blocks. 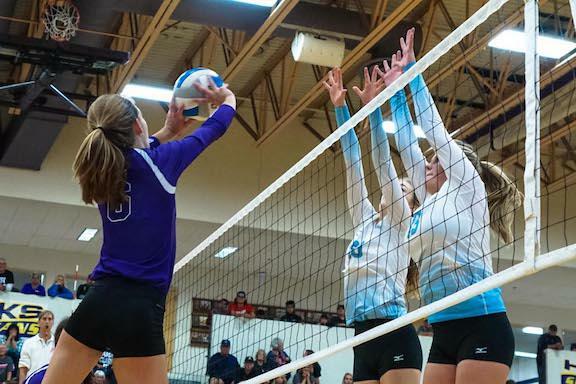 She had 17 kills with just two hitting errors in a 3-1 win over Robbinsdale Armstrong and contributed five solo blocks in each of the victories over Orono and Becker. Claire Nuessmeier, St. Peter. Nuessmeier’s done a whole lot of everything in St. Peter’s first few matches. She racked up 21 kills (with zero errors) in a 3-1 win over Tri-City United and added 17 more in a win over Worthington. The 6-foot-2 middle hitter kicked in 11 service aces and contributed on the defensive side with 22 digs in a win over New Ulm. Ally Peterson, Kenyon-Wanamingo. Peterson’s been a solid contributor for the Knights each of the last three seasons, but if the season opener against Centennial was any indication, she’s in for a monster year. Peterson stuffed the stat sheet with 20 kills, 17 digs, four blocks and 20 service receptions in a win. Jessica Nelson, Andover. Andover’s gotten off to a rocky start, but Nelson’s certainly been impressive. The 5-foot-11 outside hitter leads the state in kills with 46, including 15 in a win over Grand Rapids. She also tops the state in digs (59) and posted 27 in a loss to St. Francis. Nelson’s also tallied eight blocks this season. MN Volleyball Hub polls are for entertainment purposes only.